Oilserum containing Finnish oatoil and blueberry oil gives your face the purity of nature and the nourishing power. An oil serum containing pure Finiish oat oil and blueberryoil is a pampering skin care product for the face. Especially suitable for dry and sensitive skin, but also for mixed skin. Finnish oat oil moisturises and softens the skin, reducing inflammation and redness. Natural antioxidants, Vitamin E, fatty acids, amino acids, and betaglucan gives the oat oil regenerative, cleansing, moisturizing, protective and soothing properties. These oat properties affect the stimulation of skin metabolism and increase the production of elastane and collagen. 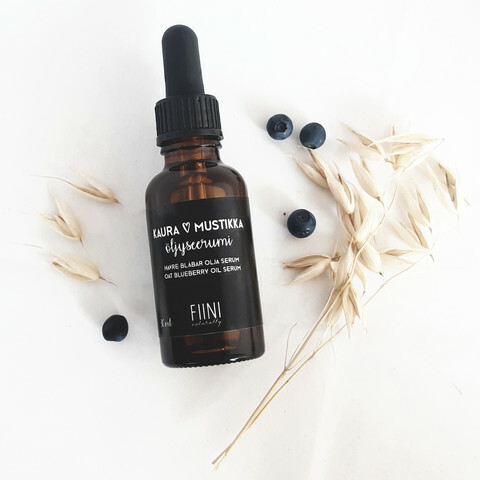 Finnish blackberry seed oil is rich in omega-9 oleic acid, omega-3-alpha-linolenic acid and omega-6-linoleic acid and vitamin E and antioxidants. Blueberry seed oil is soothing, antioxidant, skin-lightening and anti-aging. Apply gently to cleansed and moisturized face and neck areas.